David Wiesner to visit Oct. 24 at 2 p.m.
Hudson — A children’s author who won the Caldecott Medal and Caldecott Honors award for his books will be coming to the Hudson Library and Historical Society for a presentation and book signing. David Wiesner, 59, one of the best-loved and highly acclaimed picture book creators in the world, will visiting the library on Oct. 24 at 2 p.m.
Three of the picture books he both wrote and illustrated became instant classics when they won the prestigious Caldecott Medal: “Tuesday” in 1992, “The Three Pigs” in 2002, and “Flotsam” in 2007, making him only the second person in the award’s long history to have won three times. After graduating from the Rhode Island School of Design, Wiesner took any job that came along to reach his goal of creating full color picture books. He has worked as an illustrator since 1980 and a writer from 1987. Although most books have an illustrator and author, Wiesner was working toward creating his own stories and doing both. Stories written by other authors didn’t match the artwork he wanted to do, and he shifted to creating his own stories. The response from others and awards have proven Wiesner made the right choice as a storyteller with pictures. Wiesner begins by drawing and can fill boxes for every book, which takes from 1 to 3 years to complete. The visual idea generates characters and situations. For “Tuesday,” he took a drawing of a frog he had created for the copy of “Cricket” magazine and began drawing a frog in different situations. When he put a frog on a lily pad, the shape reminded him of a flying saucer. The story of flying frogs on lily pads emerged. There are many similarities writing with pictures has with words, Wiesner said. Characters, plots and the rhythm of pictures creates a reading experience that is as compelling as any text. Wordless books empower children who are deaf, have trouble reading or have English as their second language, Wiesner said. Books will be available for purchase from The Learned Owl bookstore. The free event requires registration. Stop in, call 330-653-6658 ext. 1020 or visit hudsonlibrary.org to sign up. 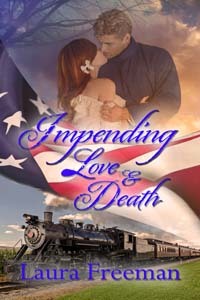 Amazon http://goo.gl/kgLlgw has a special pre-order price of $2.99 for the ebook “Impending Love and Death” until its released date Nov. 18. Logan Pierce meets the clumsy and dangerous Jem Collins when she nearly runs him over with her buggy.